One of the quilting forums that I visit on Facebook (celebrate hand quilting) has had some discussion about stippling. I have been doing a lot of stippling on the whole cloth quilt that I am working on so I thought I would write about it again. There are many ways to do stippling, random, meandering lines (like machine stippling) in an orderly pattern, many variations. I use stippling to flatten out the quilt around the areas that I want to stand out. I do the stippling by simple echo quilting around the motifs very close together, less than 1/16″ but I don’t mark or measure. Here is the area of the quilt I am working on today. The overall look has some texture, which reminds me of an orange peel, and makes the non stippled areas stand out more. Lots more quilting to go! 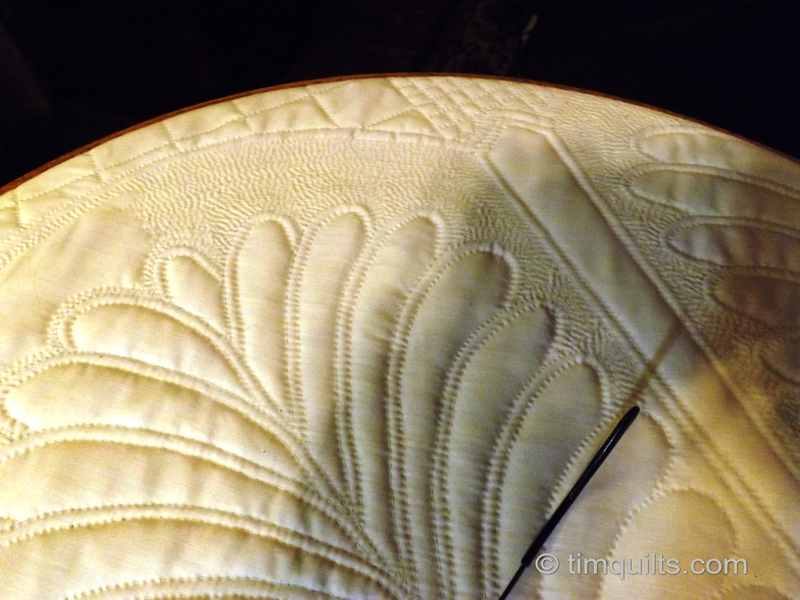 The bias binding will follow the curves that follow the feathers around the edges. This is not something I would do on every quilt because I think it would be lost on a printed fabric, but I think it is great on a solid fabric. It takes some time but it is not difficult to do. 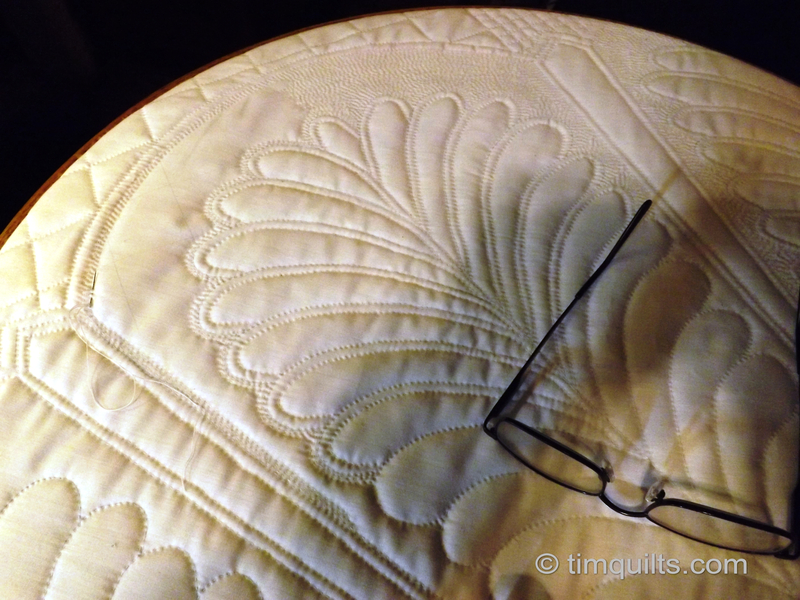 I am all for any quilting that I don’t have to measure and mark! This entry was posted in Quilts and tagged hand quilting, Quilts, stippling., whole cloth quilt. that is one beautiful quilt! I did stippling by hand on one quilt but have not done it since. like what you are doing with this one. Tim, I hope to use some stippling on my red and green quilt. Love how you explained why and how you do it. Have you ever thought of selling this whole cloth pattern, I am sure many would be very interested! The stippling makes the feather/fan pop. SOOO neat how it really accents your design. Nice work Tim. Great detail pictures of your work. When I first looked at this quilt I thought ‘why more quilting?’, but now I can see what you’re trying to accomplish. This is an amazing quilt! Tim, you are the master! Absolutely stunning! This just looks better and better!! Absolutely gorgeous work, Tim! You get a beautiful trapunto-like effect on the non-stippled motifs! Holy snap that is gorgeous. Wow oh wow!! Kudos to you. It is gorgeous. Great Photos…up close and personal!… so good to catch the detail of your amazing skill. Thanks. 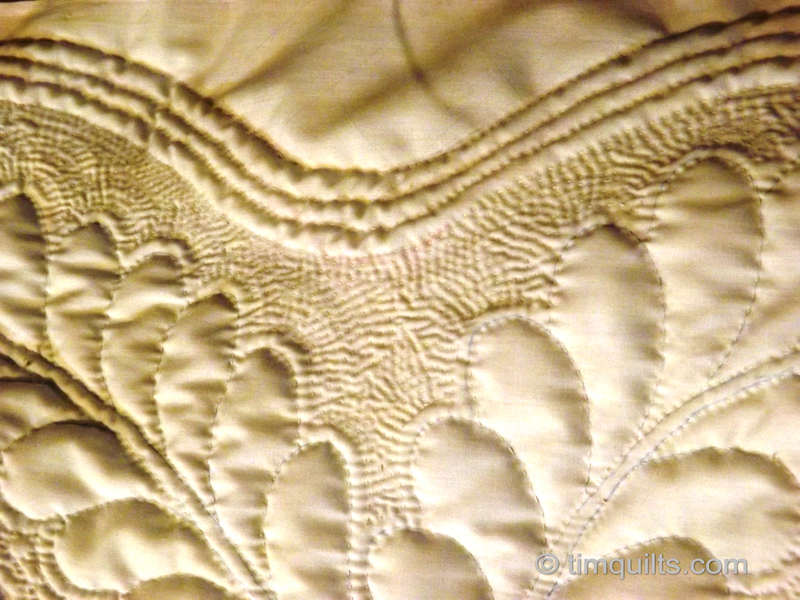 This is very unique type of quilting..i like its stitching art very nice. Looking so beautiful…I will try to do like this. 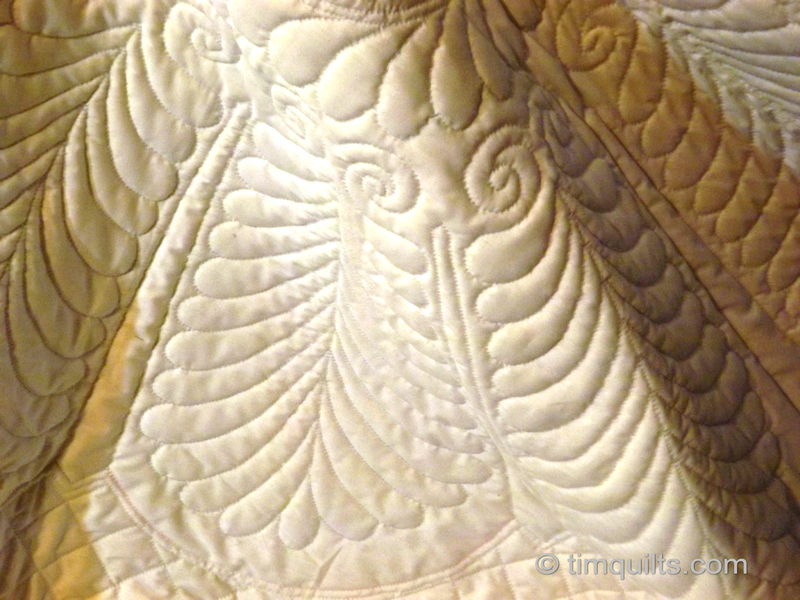 Tim what type of batting did you use in this quilt? What is your favorite batting to use? I have always said that men are the greatest needle crafters……you prove it ! 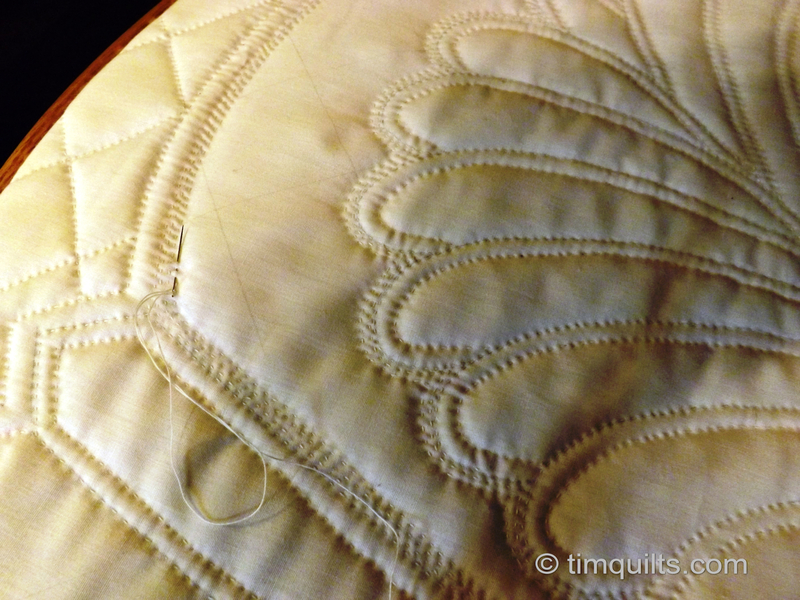 Hand quilting is truly an art. You commented on your site re: stippling, that you mark the grid and I can see it in the demonstration. Do you use a very sharp, simple lead pencil? I bow to a master. This is beautiful and where I want to go. Just to confirm what I think you are saying is that all this work is done by hand not any of it on machine… correct? It is beautiful. Wonderful handquilting, just searched the internet on stippling because I am at a section in my quilt where I can use some good advice. This has helped a lot. Thank you.